In the twelve-hundred miles of our journey that lay along Route 66, we saw a dozen places that hinted at Pixar’s fictional hamlet of Radiator Springs. 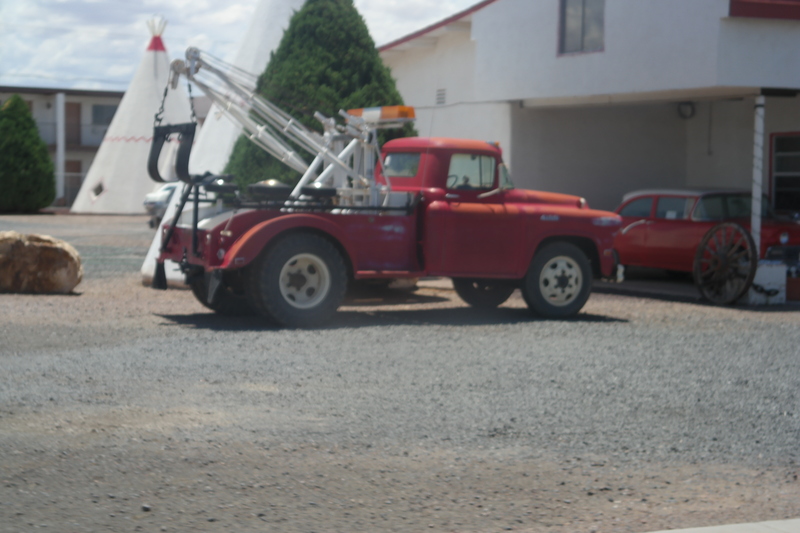 No single place captured the essence of that town more than the little burg of Holbrook, Arizona. 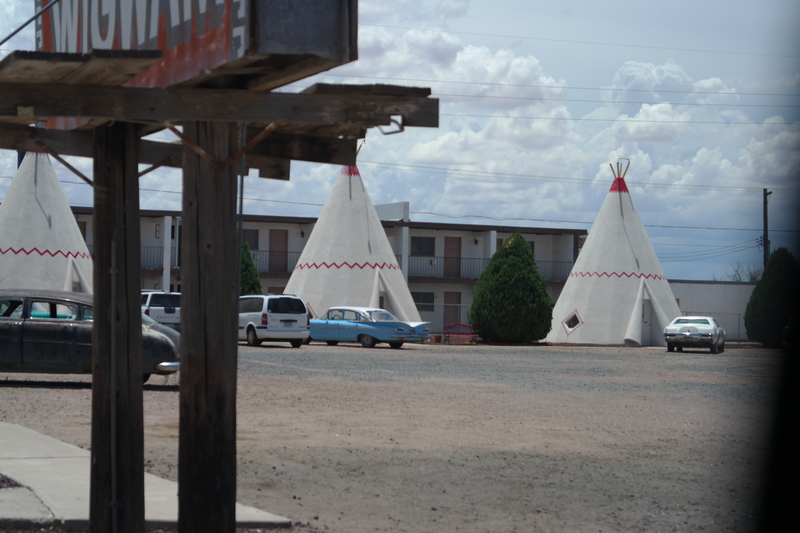 Turning a corner where the Route 66 sign pointed to the right we suddenly saw spitting images of Mater and Flo from Cars hanging out at the iconic Wigwam Hotel, itself the model for the film’s Cozy Cones Motel. At some point we all had to wonder whether Pixar’s filmmakers were drawing their inspiration from points along America’s Mother Road, or whether they were providing the inspiration themselves. Either way is fine with me: I give the Pixar flickmeisters full credit for helping to set the stage for our road trip. The images inspired my son, but what inspired me was a quote from Sally, the Porsche 911 who was Ligthning McQueen’s love interest. Driving across America proved that beyond a doubt. When we wanted to make time, we got on an Interstate. When we wanted to have fun, we went looking along two-lane roads. If we came home with a single resolution, it was to spend more time on the slow roads. That is, after all, where the real “kicks” are to be found. One thing you learn as you travel across America is that our energy and environmental challenges come from unexpected places. Arizona, a state that for many of us exemplifies alignment with the environment, apparently is not as much so as we might think. Indeed, the state has been singled out by the EPA as a producer of greenhouse gases. Much of the reason for that lies in the way Arizona has urbanized over the past half century (read “sprawl,”) and the resultant need for an air conditioner in every home, if not every window. For historic reasons, Arizona cannot lay proportional claim to the output of Hoover Dam, so it must turn elsewhere for the energy to keep its citizens cool in the summer heat and dry beneath the annual Monsoons. The Cholla Power Plant, pictured, gives a clue as to why. 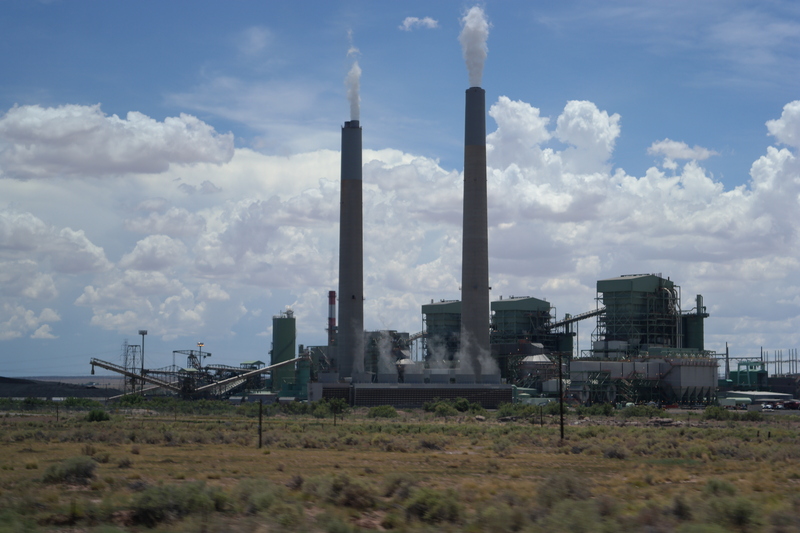 The plant is considered by the authorities to be among the dirtiest (most polluting) coal-fired power plants in the US. The EPA has put Arizona Public Service, the plan’s owner, on notice: make costly renovations to clean up the plant, or close it. The jury is still out. With our mix of nuclear, solar, hydroelectric, geothermal, and the like, California and our public utilities do not face the same stark choices that Arizona does. Nonetheless, we might, and right soon. The growing backlash against nuclear, combined with the effects of an extended drought, mean that we may for our own reasons find ourselves scrambling for the energy to power our future. Today we are focused on water. California’s next energy crisis is right around the corner, and we won’t be able to blame this one on Enron. We can only wonder if we will be ready for it, or if we will let it catch us as unprepared as we were for the drought. Riffing off of lists produced by a couple of friends – political thinker Matthew Stinson and Baidu executive Kaiser Kuo – these are the books that I have read in full that inspired my life, my work, my interests, my learning, and my writing. They are not necessarily the best fifty books that I have read, and, with apologies to my regular readers, only a few are about California. But they are books set me on my path, even if they don’t represent the best of the authors’s ouevres or are even the best on the subject. I’ll start with the spiritual stuff, so that I can hive it off separately and my atheist/anti-theist/Wicca/Humanist/doubter readers can simply skip past it. 23. War as I Knew It by George Smith Patton, Jr.
44. The Trusted Advisor, by David H. Maister et al. I know I’m missing something here. What books inspired you? There couldn’t have been more than a couple of dozen people in the entire Petrified Forest when we visited. A pity. Walking the paths between these gargantuan Triassic fossils, then reading the climatic history of this region in the layers of the adjacent Painted Desert was a lesson in mortality as well as geology. A child near us asked her father how long 200 million years was. “Well, I’m 40. So five times that long is 200 years. Now a million times that, and you’re still 25 million years from when these trees fell.” Visiting these ancient giants a week before I turned fifty, I felt like a house fly. The quiet of the park made me realize how much we have turned into a mass transit culture. Don’t get me wrong: I am an unabashed fan of boats, busses, trains and planes, and believe that these conveyances each have their place. But sacrificing our freedom to roam as individuals, the kernel of the frontier promise at the heart of our California car culture, would do more than surrender some abstract sense of freedom. It would limit us forever to somebody else’s choices about where we should go, how we should get there, and what we should see. You cannot enjoy places of wonder like the Petrified Forest and the Painted Desert from the dining car on the Southwest Chief any more than you can from an aisle seat in the Southwest 737 five miles overhead. However the prospect might tittilate the environmental extremist, I don’t think that Teddy Roosevelt would have approved. We can find cleaner ways to cross the country, but we can never take the road less travelled as glorified commuters. If we are to remain true to our essence without sacrificing our souls, we must apply our creativity to the problem of eliminating the carbon without burying the car. 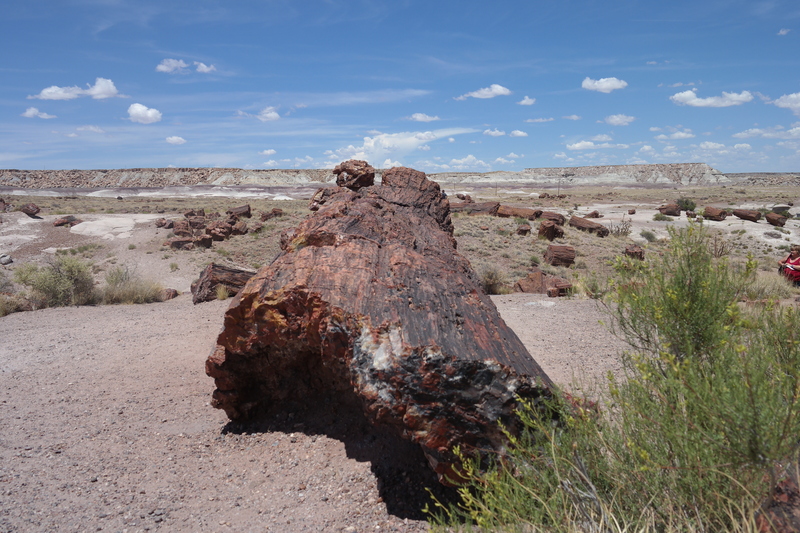 The Petrified Forest taught me, my wife, and my son important lessons that changed our lives. We need more people to learn those lessons in a way that goes beyond a book, a TED talk, the Discovery Channel, or whatever you can see out of your window at 30,000 feet. There is something about the vastness of the Colorado Plateau that, when seen from a lofty perch, invites contemplation. Standing atop the rim of the Barringer Crater, first my son and then the rest of us turned our eyes away from the extraterrestrial wonder below and looked across the Plateau toward Humphries Peak. The quiet was profound, the only sounds we heard were our hearts and the wind. 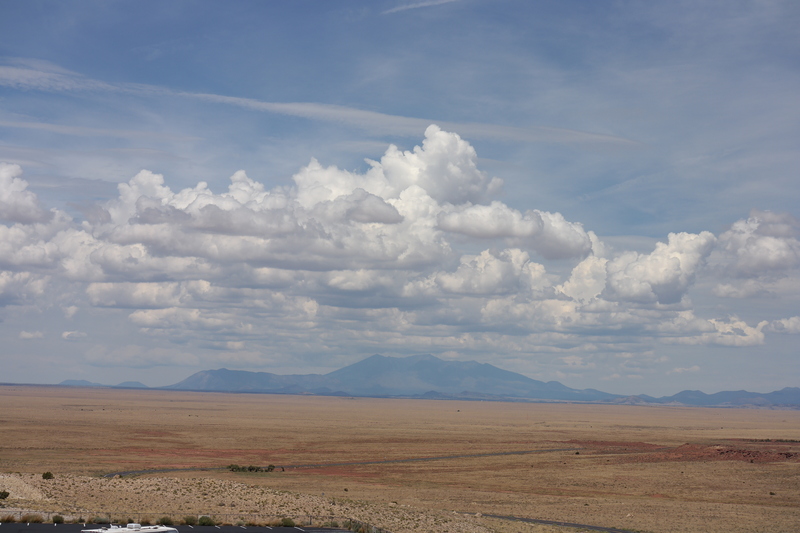 Clouds scudded low overhead, and the high desert beneath us seemed to breathe of its own accord. Caught in that state where there is no longer a divide between what is inside you and what is outside you, we were no more immune than the Anasazi, whose ghosts still walk this land, had been; or the Navajo, who still catch dreams here. Not everybody finds inspiration in the desert, anymore than everyone finds succor in the mountains. Each state we traversed, starting with Arizona, offered its own selection of places like this. It made us realize that what makes California special is not that it is the only state with breathtaking deserts, life-filled forests, enticing coasts, or fertile plains. California’s gift to the dreamers and the damaged alike is that somewhere in its unparalleled variety we can each find a place from where we can draw that strength from nature’s storehouse of life.